A must-have treasure! 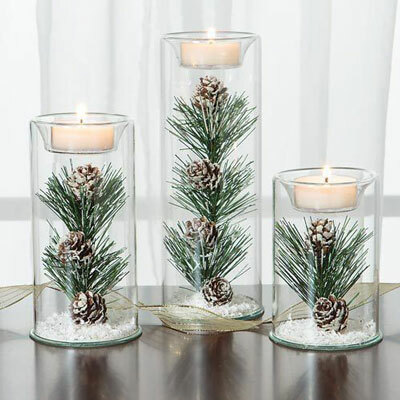 Precious clear glass Winter Tealight holders, featuring a pine branch with pinecones as the focal point, are accented with snowlike aurora borealis glitter to create an ethereal, frosty look. But when the shimmering glitter flakes catch the firelight, the effect is truly magical. Holds a single tealight (not included). Choose one, two or a set of three to create a memorable wintertime display. 2½" dia.